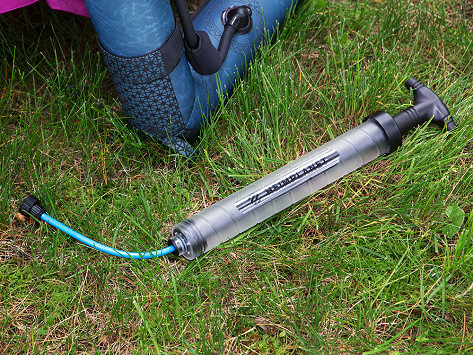 A lightweight, easy-to-pack pump for your tent or anything else that needs some inflating. Dimensions: 13.3" x 2.8" x 1.6"
How do you pitch a tent in less than two minutes? In Heimplanet’s case, you pump. 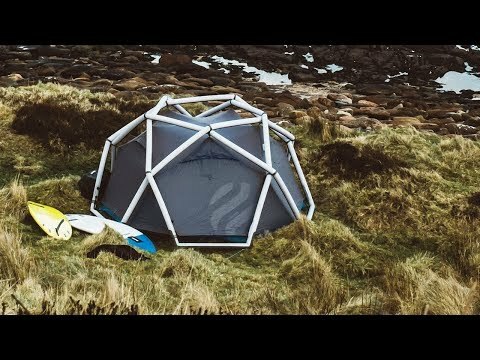 This inflatable tent isn’t just beautifully designed, it’s also architecturally sound. Double-layer beams keep the air in tight for days. And the geodesic dome shape takes its cues from structurally strong buildings, so it stays up in the face of strong winds. All the mishaps you might foresee with an inflatable tent have been thoroughly figured out. Once inflated, the beams can be divided into separate chambers. If you end up with a hole, close off part of a beam to keep the structure. And patching that hole is super easy with the included repair kit. The entrance to this inflatable abode opens wide and the side panels can be rolled up to let the light pour in. There are also ventilation points so that fresh air can circulate. Inside, the tent is just as impressive. Pockets line the walls to keep your gear organized and the ceiling has a pocket, too, so you can attach a light. When you’re done, taking it down is a cinch. Just open the valves to let the air out and fold it for your next adventure.